Policies, procedures, and competencies are the foundation of patient care and drive nursing practice. 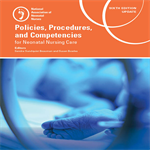 The Sixth Edition of Policies, Procedures, and Competencies for Neonatal Nursing Care, will serve and help advance an organization's commitment to evidence-based nursing and provide a strong support to neonatal nurses and neonatal nurse practitioners as they seek to give the highest quality of care to their vulnerable patients. An updated copy of Policies, Procedures, and Competencies for Neonatal Nursing Care, Sixth Edition will be available in early June. All customers guaranteed a replacement copy or on backorder will be shipped the new copy in early June. • includes new competencies on Neonatal Withdrawal and aEEG Monitoring, as well as a new policy on Donor Milk Use. This updated resource will serve and help advance an organization's commitment to evidence-based nursing and provide a strong support to neonatal nurses and neonatal nurse practitioners as they seek to give the highest quality of care to their vulnerable patients. A downloadable PDF companion piece is included with purchase of the book. Once purchased, the companion piece will display in My Classroom, when logged into your NANN account. NANN members save $160.00 USD or more!